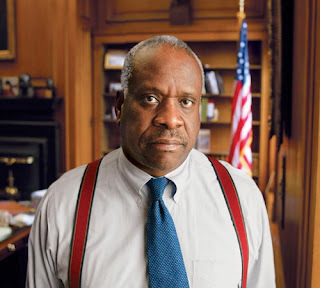 Justice Clarence Thomas; or should we call him: Uncle Thomas? The conservative recently hit his 20-year anniversary as a Supreme Court nominee. His career on the bench has been marked by his willingness to stand alone in dissent. Each summer, Supreme Court Justice Clarence Thomas invites his four new law clerks to his home to watch a movie. Not just any movie, but the 1949 film version of the classic of libertarian conservatism, Ayn Rand's "The Fountainhead." The movie's hero, played by Gary Cooper, is an idealistic but stubborn architect, who, as Rand wrote, "stood alone against the men of his time." A character, it might be said, a lot like Thomas himself. "If you think you are right, there is nothing wrong with being the only one," he said last year in explaining his fondness for the movie. "I have no problem being the only one." Twenty years ago last Friday, President George H.W. Bush nominated Thomas to the nation's highest court. In the years since, Thomas has routinely been referred to as a member of the court's conservative bloc. But the label hardly captures the distinctiveness of his record. In an institution where the ability to decide the law depends on creating a five-vote majority, no other justice is so proud of standing alone. He strictly avoids the give-and-take among justices during oral arguments; he has not asked a question or made a comment in more than five years. And his most provocative opinions have been solo dissents. Among them, he has declared that the Constitution gives states a right to establish an official religion. Prisoners, he wrote, have no constitutional right to be protected from beatings by guards. Teenagers and students have no free-speech rights at all, he said in an opinion Monday, because in the 18th century, when the Constitution was written, parents had "absolute authority" over their children. Two years ago, the court ruled that a school official could not strip-search a 13-year-old girl to look for two extra-strength ibuprofen pills. Thomas — alone — dissented, calling the search of her underwear "reasonable and justified." Alone, he voted to strike down a key part of the Voting Rights Act that is credited with giving blacks political power in the South. And he was the lone justice to uphold the George W. Bush administration's view that an American citizen could be held as an "enemy combatant" with no charges and no hearing. He is seen as a sure vote to strike down President Obama's healthcare law and its insurance mandate because he already has called for striking down a wide range of 20th century federal laws that regulate business, saying they go beyond Congress' power. Conservative scholars who admire Thomas say he, more than any justice, exemplifies the legal theory of "originalism" — the idea that the Constitution must be interpreted solely as its words would have been understood by those who approved it 222 years ago. "He looks to how the Constitution was understood at the time of the ratification. He goes to first principles. And he is willing to challenge precedents that deviate from the original understanding," said John Eastman, a Chapman University law professor and former Thomas clerk. His critics see a justice out of step with the court and the country. "He is the most radical justice to serve on the court in decades," said Erwin Chemerinsky, dean of the UC Irvine Law School and a liberal constitutional scholar. He "would change the law dramatically and give little weight to precedent. It's easy to overlook how radical [he is] because his are usually sole opinions that do not get attention." During most of his tenure, Thomas rarely has written major opinions for the court. Because his views did not sit well with the moderate justices needed to form a majority, former Chief Justice William H. Rehnquist often assigned him tax and bankruptcy cases. But this year, under current Chief Justice John G. Roberts Jr., he has spoken for the court's conservative majority in significant decisions that limited the rights of prisoners, which has become his signature issue. In March, he announced a 5-4 decision that threw out a $14-million jury verdict in favor of a black Louisiana man who had been convicted of murder and nearly executed because prosecutors hid evidence that could have proven his innocence. A month later, Thomas said a state's "sovereign immunity" barred inmates from suing for damages when their freedom of religion had been violated. Still, it is Thomas' willingness to go solo that most defines his career. It is a tendency that was almost certainly reinforced by his bitter and ugly confirmation fight in the Senate, which was dominated by questions about his qualifications and allegations that he had sexually harassed former aide Anita Hill. Bruised, he withdrew to a closed circle of loyal friends and clerks. The relationship with his clerks remains close. "They're my little family. They're my kids, and I just really like having them around," Thomas told legal editor Bryan Garner in 2007. The clerks take the lead in writing and editing opinions, he said. "Nothing comes to me that hasn't been through aggressive editing" by all of the clerks, Thomas said. And there is no room for contrary views. "I won't hire clerks who have profound disagreements with me," Thomas told a Dallas group. "It's like trying to train a pig. It wastes your time, and it aggravates the pig." From the start, Thomas was destined to be controversial. He is an African American conservative who was named to replace a civil rights legend and leading liberal. It was the last week of June 1991 when Justice Thurgood Marshall, the court's first African American, announced he would retire. That week, Thomas turned 43. He had spent the 1980s as a Reagan appointee heading two civil rights offices and had earned a reputation as an outspoken conservative. He had served one year as a judge on the U.S. Court of Appeals in Washington. The elder Bush announced Thomas' nomination July 1. "The fact that he is black and a minority had nothing to do with this in the sense that he is the best-qualified at this time," Bush said. At his confirmation, Thomas reassured senators he would bring "no agenda" or ideology to the court. "I believe I can bring something different, that I can walk in the shoes of the people who are affected by what the court does," he testified, referring to his childhood poverty. He said that seeing "busload after busload" of mostly African American criminal defendants arriving at the District of Columbia courthouse, "I say to myself almost every day, 'But for the grace of God, there go I.'" He was confirmed by a 52-48 vote, the closest victory margin for a justice in more than 100 years. Thomas has proven to be the ideological opposite of Marshall. "They are virtually mirror images of each other," said USC law professor Lee Epstein, who tracks justices' voting behavior. Marshall and William O. Douglas were the most liberal members of the Warren Burger court in the 1970s. Thomas has been the most conservative member of the Rehnquist and Roberts courts, Epstein said. Nowhere is the difference more apparent than in cases involving prisoners. Marshall wrote the court's opinion holding that deliberately subjecting prisoners to cruelty, including refusing them needed medical care, can violate the Constitution's ban on cruel and unusual punishment. Thomas, alone among his colleagues, continues to oppose that ruling. The constitutional ban has nothing to do with what happens to an inmate in prison, he argues; it only limits what sentence the defendant may receive. "Judges or juries — but not jailors — impose punishment," he said. By that standard, brutal beatings meted out by a guard do not qualify as unconstitutional punishment. In November 1991, two months after Thomas took his seat on the court, the justices heard the case of Keith Hudson, a Louisiana prisoner who had been handcuffed and then repeatedly punched in the face and kicked by a guard. His teeth and dental plate were cracked. He sued, and a magistrate awarded him $800 in damages. Roberts, then the Bush administration's 36-year-old deputy solicitor general, argued on behalf of the prisoner. He said that although guards may use force to maintain discipline, it is cruel and unusual punishment for them to brutally beat inmates. The Supreme Court agreed in a 7-2 decision. Thomas dissented. "In my view, a use of force which causes only insignificant harm to a prisoner … is not 'cruel and unusual punishment,'" he wrote. Thomas' approach would permit the torturing of prisoners, Justice Harry Blackmun said. Whenever the court has rebuked prosecutors for removing blacks from a jury, Thomas has dissented. And when a 7-2 decision sided with a black manager at a Cracker Barrel who was fired after complaining about the mistreatment of another black employee, Thomas dissented. "Retaliation is not racial discrimination," he wrote. Decisions of that sort have made Thomas, the only black justice, a divisive figure among many African Americans. Last month, he was invited to speak in Augusta, Ga., at the dedication of a new county courthouse to be named for Judge John Ruffin, a civil rights pioneer and the first black superior court judge in the city. Some protested the choice. "Ruffin detested Clarence Thomas," said Mallory Millender, a retired professor from Paine College in Augusta. Ruffin's widow, Judith Fennell Ruffin, said she was honored the justice would participate in the tribute to her late husband. "We may have different opinions, but he was coming as our guest," she said. Thomas spoke to the local bar and denounced the "cynics" who "demonize" the court without reading its opinions. "I think there is a disease of illiteracy or laziness, because just the commentary will tell you they haven't read it," he said. Away from the court, Thomas offers mixed views of his job. He rarely speaks about the law, even when addressing law students, except to say the justices get along well. "I have never heard an unkind word" in the court's private conferences, he says. "There's not much that entices about the job," he told another college crowd in California. "There's no money in it. No privacy. No big houses. And from an ego standpoint, it does nothing for me." While it is an honor to be a Supreme Court justice, "I wouldn't say I like it. I like sports. I like to drive a motor home," he said. What he and his wife, Virginia, really enjoy, he says, is taking to the road in the summer in their 40-foot motor coach and meeting new friends at RV parks. Still, he figures to be on the court for many years to come. Marshall was 83 when he retired, and Thomas, now 63, says he would like to match him. If so, Thomas is at the midpoint of his court career, with 20 more years ahead of him.